This is a twisted twist on the BuildingLoop composition I last uploaded. This uses Kineme3D (the most recent beta) and Texture Tools... it should work on Leopard or Snow (save for if one was to enable the new shadow effect in the Lighting, which doesn't work with iterated objects... bug filed with Apple on that already). 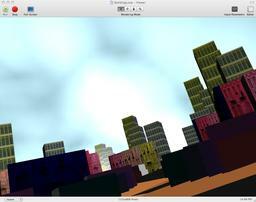 It takes the city scene, and uses the Kineme3D to generate a Height Field that can then be warped. BTW... in the making of this, I realized that the multisampling option's "anti-aliasing" effect goes away as soon as you put something (a rendering macro) inside of a render in image environment. This makes sense, but also makes me wish that the render in image had a similar type of multisampling setting. (I know you can do "brute force" anti-aliasing with a render in image, but I like the look of the new multisampling better). Nice. That Kineme3D HeightField patch is sorta cool, isn't it? Feed in an image, output an object. I used it myself in some feedback trials and found it to be quite handy. Yeah, I kept whining about that the second that Chris let on that it (extrusion) might be a possibility. It's actually one of my TOP favorite things that I can do in QC. I love it with Freeboard, to make 3D GLSL letters! You can also use it to define a collision point with Particle Tools (which come to think of it, is now wonky in QC4 b/c of blend mode stuff). That's one of my favorite features of all! To be able to make a 3D Heightfield from image, and then have particles collide and react to that is amazing to me. I see I had a variant with a Z of 0 uploaded for a bit... my bad. The Z on the 3d renderer should be 1, and it's corrected. i will have to check out 3d height field lee has been talking about it i have not used it as of yet. im going to give it try. so george you more or less built this procedurally with an iterator. Z fixed at my house. Thanks. Yeah, dust and I discussed that HeightField patch very briefly just the other day. It therefor pleased me to see you present it at this time. I'll be trying some things based on your usage observations. Thanks for the tips! I posted the Depth Bomb qtz quite a long while ago... you may wish to check that out, because of the Polygon Mode setup addition. It's certainly more of a Height Field workout than this is. Would you believe that most frequent posters here also have a folder with their name on it, on my computer? Regardless, yes they do. And was Depth Bomb in the gtoledo folder? Nope, it wasn't. So I searched it out here at Kineme and having found it, all I can say is WOW! A variation on this beaut is going into my personal-use-only CamTwist effects folder as an image filter! Hope you approve. As I've mentioned before, I think these comps ought to be used for purposes other than mere studies whenever possible. It always gets dicey for me when people start talking about if something in QC is procedural or not... I'm not sure! I see QC as basically a really high level object oriented programming environment / generative thing. Secondly, I think of it as a "media moog" or kind of like soft-synth for media related programming, with all of it's modules, and patch bay type appearance. I see what you're saying, since the iterators have to be nestled inside of one another to do things like this. Sure, sounds like a good idea... as a matter of fact, I've setup versions to masquerade as image filters before... I don't have it (them) handy right now though. I touched on it, but as long as we're talking about the Height Field, one aspect of it that's really cool to me is that you don't have to use the same input texture image as what you use to create your Height Field... or you can process the image before it hits the height field (I may have done that in the depthbomb.qtz by adding a color control... if I didn't, it's something that I commonly do, or throw a gamma patch down, etc.) Sharpness filters can also be cool, but obviously sap fps. I LOVE that you can wrap it with GLSL too! I like to use toneburst's Glossy Wet GLSL (a personal favorite), and doing stuff with GLSL things that play with vertices or do bump map type of things again can be really weird/cool. Thanks. I'll try those things. By the term 'image filter' btw, I didn't mean to imply some strict protocol conformed thing-a-mahoolie. Those types are a sometimes problematic because they don't allow any renderers to be at root level. All that's needed in most cases is to have an image input port, perhaps on an image splitter, that's been renamed to "inputImage". That way any old composition can be used for such purposes. Typically, the composition will then pick up whatever it's supposed to pick up as an image source, be it a cam or an underlying image filter chain or whatever. I mention it because I'd really like to see more folks doing more things with their compositions. Oh, I see what you mean. You can always stuff everything inside of a render in image, and then output it to the protocol out, if it was necessary. True, and I've worked with that a lot but it's not always ideal because if the image filter chains become lengthy .. the many Render In Images can start adding up and negatively affecting performance. Anyway, we're off topic. Just a final note to say that this methodology can often be an excellent way to quickly explore the pre-inclusion of many alternative patch configurations, such as those that you mentioned previously. You know what you might want to try out on that (? ); if you are using one, (or more than one) render in image to feed a CI filter that's kind of "expensive" fps-wise, but that's a kind of overt filter, you can take and downsample it by half of either the source image or rendering destination size. Sometimes, you can get away with even more. If you're feeding a heavy blur or something that works over the edges heavily, there's really no apparent image loss, or it can at least be usable... in fact, the quicker fps can in some cases make it seem like an image improvement. A render in image can be used to make things run faster if used that way... it can be very handy for that. What is downsampling? Rendering destination size .... hmmm. Are you talking about in a single, stand alone composition? I guess you are. Feeding a CI Filter, you said. Ok. I'll try that. Thanks. What I was hinting at was a different scenario, such as Apple's Concert filter over a Depth_Bomb filter over a Growing filter over a Kaleidoscope filter over chroma-keyed webcam over blah, blah, blah ..... each an individual composition acting as a filter on the individual composition beneath it. Totally ridiculous imaginary layering example btw, but illustrative of what I meant by using our own compositions or portions thereof as image filters. That's the type of usage in which the Render In Images can pile up if each composition uses them to hide a renderer in order to enable protocol conformance. Flipping between the quarter and full sizes should especially show the difference I'm talking about. Granted, the visual result isn't going to be exactly the same - sometimes it's close than others, just depends... it's nice if fps does happen to matter. Using this kind of concept can especially shave off fps with multiple render in images, or when nestled render in images are going on. ah! I see it and understand it. Thanks! I might be able to apply that with some frequency. Should be a useful tool. Thanks again! You're going to hate me, but I'm determined to explore the potential for this within my own limited interest area which means across multiple compositions, which means sp..ky. I know, I promised I wouldn't mention it. sigh. I think I still never communicated my thoughts on that correctly. People trying to do stuff like that is how new features happen! I was just saying that QC can be kind of fussy in that it doesn't account for it very well, even with the stock OSC stuff. I would actually use Spooky or OSC (or whatever) all day long if I was doing the stuff you are up to. It sounded like whoever was posting was trying to make some kind of pro app, or use it in a scenario in front of an audience... so I was just advising to vet the heck out of it first, given potential issues. What would be sweet is if the hosting app could do some "ordering" of the qtz's so that it would be really clear what's supposed to execute first in scenarios where QC can get confused. What's really cool is for you to have done a foray into that so much, that you probably have encountered some really specific things that don't work. That's the stuff that's really valuable, because a system can then be made. So, if anything, I extremely like conversation about stuff like that. Yeah, that's the issue for sure. But perhaps difficult to implement for visualist type apps? Because those applications are intentionally purposed to offer broad flexibility in rapid manipulation of imagery layering positions? Everything is always moving around? I dunno. I'm not a programmer. Haven't a clue about it, actually. My thanks to you for the illustration. I understood your initial concept after the brief moment of reflection that I noted, but it would have taken me a long time to figure out how to implement it.